What is Word List Assistant? OnScreen with CrossScanner uses multiple sorted text files with frequency counts to identify word completion candidates. Since different users require different types of words, the ability to modify & optimize the word lists to match a specific user is desirable. 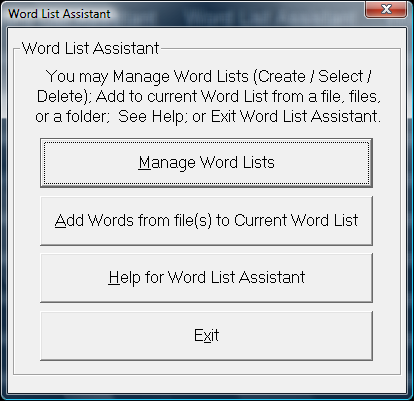 The Word List Assistant provides various options to help manage multiple Word Lists. How do I work with Word List Assistant? When selected, this option will compress the current Word List (it does not delete the current Word List files) and automatically names the list (WL_[Date]-[am/pm][Time]). 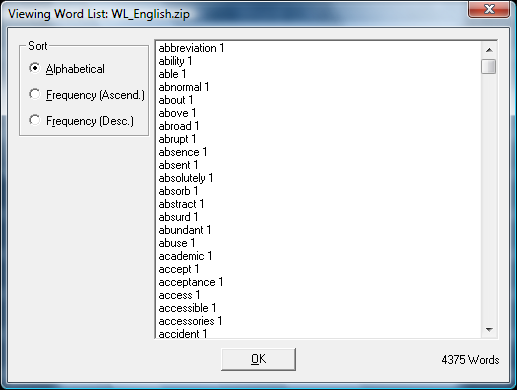 If you select one of the available Word Lists, the list will be opened for viewing. Hints: Your current Word List will ALWAYS be saved when you enter Manage Word Lists. If the Word List Assistant is used often, this will create many word list files - however, it is easy to select many files (click & drag), then use the Delete Selected option to clear out any unwanted word list files. This automatic approach preserves word lists as snapshots in time, which may be useful if manipulating word lists using the Word List Assistant. All Word Lists managed with this tool will be prefixed with Word List prefix (WL_) - you do not need to enter it. Note: The Word Lists are text files with 3 header lines followed by a word (or words with spaces), a space character, and then a frequency count, completed with a carriage return/line feed character combination. 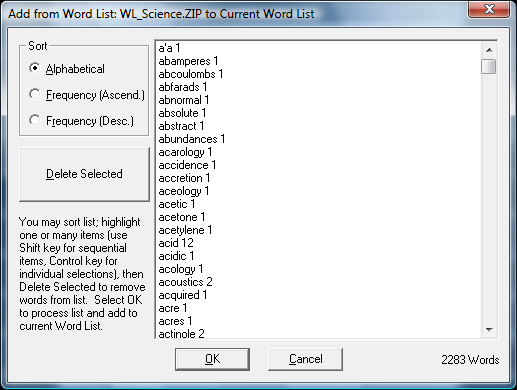 It is recommended to let this tool & OnScreen with CrossScanner manage these word lists for you. If you wish to work with these lists directly, you are welcome to, but please be completely familiar with the structure of the existing files prior to modifying them. OnScreen with CrossScanner has various checkpoints to handle ill-formed lists, but there is no support for OnScreen with CrossScanner operational issues if you modify lists directly. The internal logic starts at the end of the line and finds the first space character (from the end), then uses the resultant text between this spot and the end-of-the-line to establish the frequency value of the entry. All text from the beginning of the line to this "last-most" space is used as the word list candidate. Commas are not allowed in the word lists, as this is the separator used to identify individual word list candidates. The Word List files are stored in a WordLists folder underneath the current user's configuration location. To reference the current location, see OnScreen with CrossScanner Setup | File | Show Config File Location. Refer to the ConfigPath in the Initialization file for further details. You can double-click on a word list to view, or select a word list, and click on this button. When viewing a word list from the Word List Assistant, you can sort the list alphabetically, by frequency (either ascending or descending). When frequency sorted, the list shows the internal representation (numbers) used to properly sort the list. 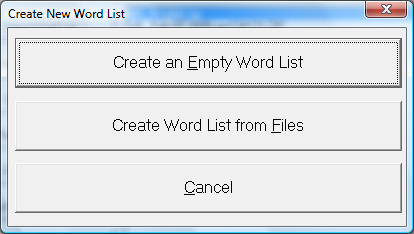 You can create an empty word list, or create a new wordlist from existing files. You will be asked to name the word list. Simply enter the new name (the WL_ prefix and .ZIP extension will be automatically entered). If you select the "from Files" option, you can then select one or more files to use. Depending on your situation, it may be easier to manage many word list files separately, and then merge them to make a final version. Once you are happy with your current word list, you can return to the Word List Assistant, select your most recent word list, and rename (or copy) it to a newly named word list. You can copy an existing word list to a different word list. Simply enter the new name (the WL_ prefix and .ZIP extension will be automatically entered). You can rename an existing word list. Enter the new name (the WL_ prefix and .ZIP extension will be automatically entered). You can remove (permanently delete!) existing word lists or multiple word lists by highlighting one or many, and click on Delete Selected. IMPORTANT: This will destroy the word list files if you confirm the deletion! This merges a selected word list into the current word list. You have the option of deleting any words that are not desired or are inappropriate by highlighting one or many words, and clicking on Delete Selected. Once you are satisfied with the list, click on OK to Add these words to the current word list. This makes the selected word list the current word list used by OnScreen with CrossScanner. IMPORTANT: This will overwrite your current word list! Also note that the Word List Assistant ALWAYS saves your current word list (as indicated above). Review the new additions to delete any words you do not wish to add - you may sort Alphabetically, or by Frequency (both Ascending and Descending). Hints: To easily add a small number of words, use the Edit Word lists option directly from OnScreen with CrossScanner Setup - the Advanced nature of the Word List Assistant means it doesn't duplicate this basic functionality. To easily add a specific set of words, enter the words into Notepad, and save the file (default type as Text file), then open the file and process it with this option. If you wish to edit specific words, add them and then return to the Edit Words dialog. If you need more flexibility or more control, you may also use Notepad to edit the word lists directly (they are saved as Text files). It is extremely likely that various character sequences and non-words will be added to the list - Always review the list to delete items that you do not want in your word lists. If you get a large amount of undesirable character sequences, try converting the file (File | Save As) to a different file type from the source. For backwards compatibility, files must be ANSI (rather than Unicode). A fair amount of error checking is handled within the Word List Assistant, but every last possibility has not been addressed. This tool is meant to bring in basic documents and add the words that a particular user works with most often. If you experience operational errors, reduce the number of files you are processing, increase system memory, or review the documents directly. If you have problems with a particular file type, you may want to convert the file into a different format and try again. Words are built from the alphabet, and international characters above 128 (ANSI - see Character Map). All punctuation, brackets, parentheses, and the space character, are treated as non-word characters, and end the current word (except the backslash \ and single-quote '). Advanced Notes: The 2 folders that Word List Assistant works with are the configuration files folder (where the current Word List files are located), and the WordLists sub-folder (where compressed Word Lists are stored, and where temporary Word List files are created (e.g. A.TXT, B.TXT, etc.)). 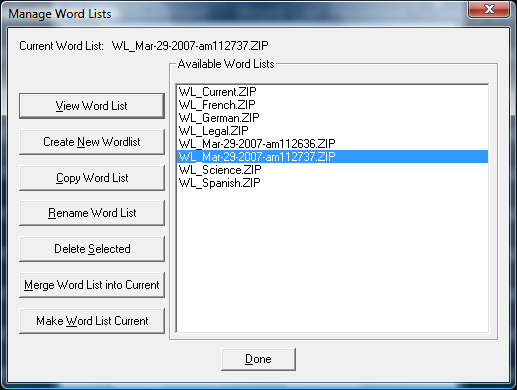 When Managing Word Lists within the Word List Assistant, it is important to realize the "Current" word list is never touched or modified, unless one of the options to modify it is selected (Add Words from Files to Current Word List, Manage Word Lists | Merge Word List with Current, and Manage Word Lists | Make Selected Word List Current). Although saving the current word list every time the Manage Word List option is selected may seem excessive, it guarantees that Word Lists will not be lost, especially when people new to the Word List Assistant start trying the various options. Since these files may be deleted from with the Manage Word List option, and users familiar with the Word List Assistant will not be constantly creating new backups by going into the Manage Word List option, this seemed the appropriate solution, and is less confusing than the approach tried in the previous Word List Assistant (where the user was asked to name the current backup). The ZIP32.DLL/UNZIP32S.DLL file used to extract the Zip file was not developed by Innovation Management Group, Inc. The following copyright & license information is included here as required. This is version 2000-Apr-09 of the Info-ZIP copyright and license. The definitive version of this document should be available at ftp://ftp.info-zip.org/pub/infozip/license.html indefinitely. Copyright (c) 1990-2000 Info-ZIP. All rights reserved. 2. Redistributions in binary form must reproduce the above copyright notice, definition, disclaimer, and this list of conditions in documentation and/or other materials provided with the distribution. 4. Info-ZIP retains the right to use the names "Info-ZIP," "Zip," "UnZip," "WiZ," "Pocket UnZip," "Pocket Zip," and "MacZip" for its own source and binary releases. Except where otherwise noted Copyright © 1993-2009 Innovation Management Group, Inc. All Rights Reserved.